UberConference is an audio conferencing web application that finally enables everyone to have total control over their meetings. Built with the expertise of Craig Walker, the founder and CEO of GrandCentral and Google Voice, this service will definitely increase your productivity and enable easy conferencing for every participant of the meeting. 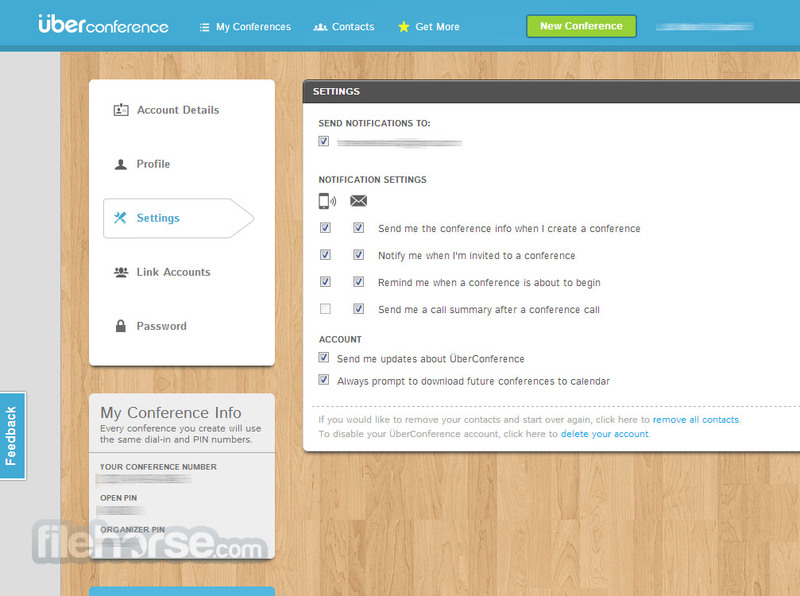 After you start UberConference you will be welcomed with an inturitive interface that was specifically designed to easily be used by anyone. It features automatic authentication of callers (no PIN numbers needed), advanced social ID for learning more about the people you are talking with, visual interface for seeing who is currently talking (or producing loudest background noise), full call management options (call, mute, add, remove, earmuff), automatic support for Evernote summaries, group text chat for sharing of text and links to all call participants and more. Free conference calling! All that can be done for absolutely free, but if you demand more, paid membership will allow you access to scheduled and recurring conference calls, outbound dialing to local phone numbers, upload of MP3 for background music, unlimited call recording into MP3 files and more. Perfect conferencing apps for both home and professional users! Managing connection with the distant people can be hard even in home environment, which means that business relationship and managing to easily gather local team members, employees form different locations, clients, business partners and freelancers is even harder. Teleconferencing is this modern age can reach people on many more locations with access to mobile phones and tablets, forcing business meeting apps to incorporate new services and scheduling options. Built from the ground up to support all modern audio tools and streamlined task manager and communication features, UberConference enables everyone from home users to large enterprises to setup audio meetings where individual attendees can use various means of connection. All meetings are placed inside great user interface that will enable them to easily share ideas, documents and plans no matter where they are. UberConference is a communication-centric webapp that strives to provide every home, professional and business users with a integrated set of tools that can enable seamless planning, management and connecting via audio conferencing sessions. 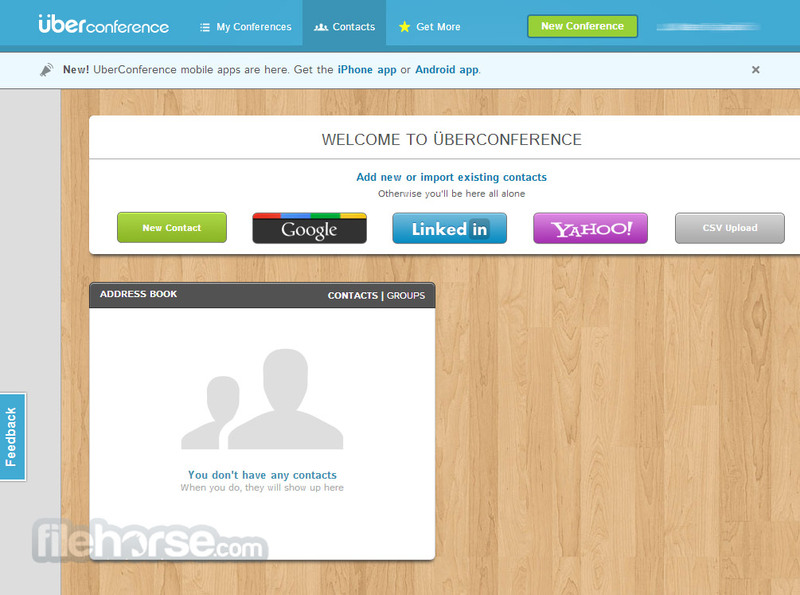 By utilizing the integrated tools that UberConference offers, teams and businesses can easily organize their communication sessions, hold meetings, webinars, learning sessions, training sessions, and much more, all held from inside highly intuitive web interface that is easily manageable by call organizers and even more easily accessed by guests who don’t even need to have UberConference accounts. With this service, organizers can easily plan unlimited amount of conferences, communicate with HQ quality audio codec, record calls, build contact database by linking UberConference with Facebook, Google+ and LinkedIn, access UberConference services via highly-capable mobile apps, gather up to 100 callers into one meeting, dial out to a physical phone number to add guests to a call, supper for calling-in from 40 international countries, and the UberConference can even call attendees to notify them that conference call has started. Free conference calling! 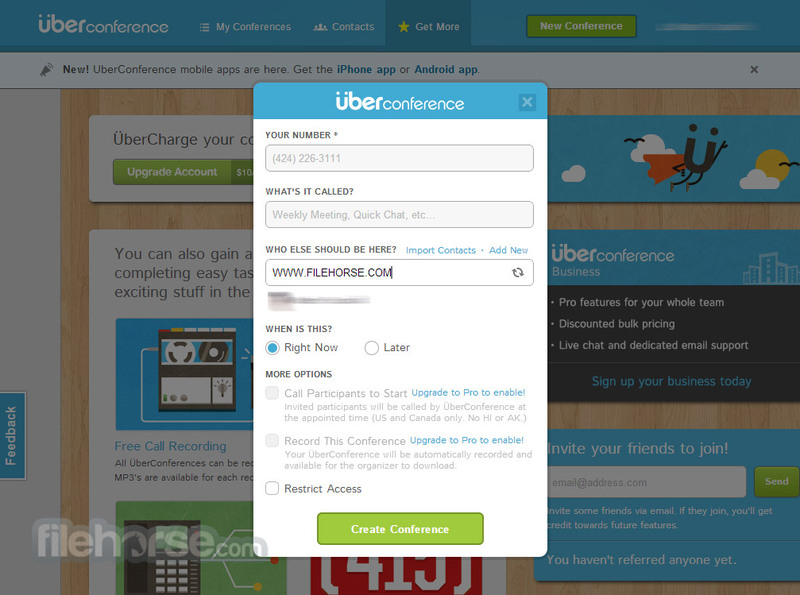 One of the most notable things that UberConference has just hit right is its interface and the way users can easily control their calls. Scheduling of meetings is easy, control of active participants mid-call is effortless, organizers can call home computers, laptops, smart phones, flit phones and even land lines, end easily control the noise levels or activate text chat for people who are unable to speak during the active conference call. And all of that is accessible both with free and premium tiers of use. One of the best strengths of the UberConference is the way its developers managed to mix attractive interface with powerful task, contact, and live meeting management tools. Setting up meetings and inviting participants with UberConference is very easy and intuitive, and users who once learn how to manage their UberConference sessions will have no problems moving from PC web interface to mobile devices and other way around. Free version of UberConference is highly capable and can be used easily by smaller teams that are satisfied with having up to 10 participants at audio conferences. Professional users who demand higher attendance rates and access to more tools can pay $10 per month for Pro account tier. Even higher Business tier exists, but its pricing is undisclosed. UberConference is one of the best teleconferencing services on the web today, enabling teams, companies and large enterprises to save even up to 90 percent of costs that would be needed for achieving similar results with other solutions. UberConference moves away from per-minute rates or large fees, giving everyone chance to make their voice heard in team meetings. Free conference calling! A beautiful in-call interface ensures you always know who you're on the call with. The current speaker is always indicated at the top of the in-call interface. Mute, hang up, or "earmuff" specific callers with easy to use in-call controls. Integration with top social networks allows you to learn about people on your call. All ÜberConferences can be recorded and the MP3's can be downloaded later. When a conference begins, the system will call all invited participants to join. 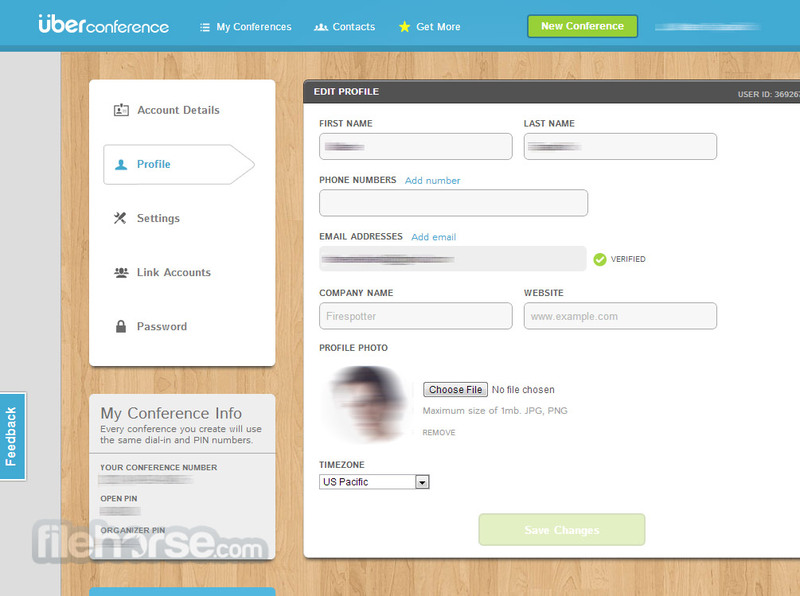 Conferences can be created instantly, and participants are alerted by email/SMS. Participants who can be identified by caller ID won't ever need to enter a PIN.